If you are using Microsoft Outlook as an email client then the items like email, tasks, calendars etc. are store on a mail server or system or both. Outlook items that are saved on your system are kept in Outlook Data File (.pst or .ost). 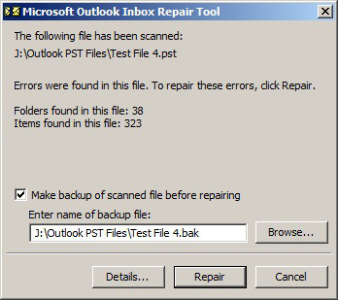 Outlook data file (.pst) is create at the time when you are using Microsoft Outlook as a standalone utility. If you are Integrating Outlook with an Exchange account, then your items normally delivered to and saved on mail server. To permit you to work with messages without connecting to the mail server, another type of data file is introduced by Outlook name as offline Outlook data file (.ost) is kept on system. Outlook Data Files (.pst) are used for web-based mail account POP3 and IMAP. You create .pst file at the time of backing up Outlook database file on system, it can also be used in Exchange account. Outlook Data Files (.ost) are used when you have an Exchange account want to work offline. It's a copy of data that are saved on mail server and don't need to be backed up like Outlook Data File (.pst). Virus or Other Malicious Software. Method 1: Scanpst.exe - It's a free inbuilt utility provided by Microsoft Outlook to fix corruption in .pst and .ost files. It gets saved in your system at the time of Microsoft Outlook installation, its location varies at your system according to the version of Outlook and Windows. Double click on Scanpst.exe located at drive drive:\Program Files\Microsoft Office\OFFICE12. Method 2: Truncate Huge Sized PST File - Sometime PST file get damaged due to the file size limit. As the older version of Outlook has the limit of 2GB only and when it get exceeded the entire file get corrupt. In order to fix this issue truncate PST file so that it goes back to defined size limit of 2GB. 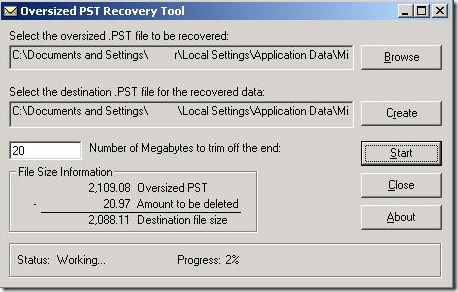 PST and OST crop tool reduce the size of your database file by deleting 25 MB to 50 MB worth data. Note: This tool remove some of your emails and however this is the only way to get your file open again. You use it with care and only as a last option. Select oversized .pst file by clicking on "Browse" button and then "Open"
After that click "Create" to select name and location of truncated data file and then click "Save"
What If Free Tool Fails to Fix Corruption? 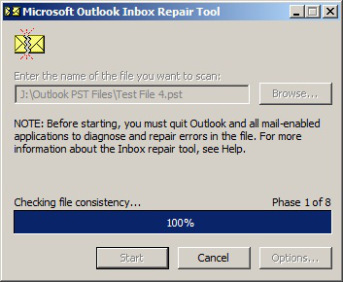 If above manual solution unable to resolve corruption in Outlook data file (.pst and .ost), then use Outlook PST Recovery utility to fix all the bugs in Outlook file.